What Do You Need To Measure For Your Work's Noise Regulations? When making measurements to estimate the noise exposure of a person at work, you need to ascertain the equivalent continuous A-weighted sound pressure level (LAeq) that represents the noise the person is exposed to during the working day. You also need to ascertain the maximum C-weighted peak sound pressure level or levels to which the person is exposed. The action levels described in the regulations are given as daily (LEP,d) or weekly (LEP,w) exposure values along with peak sound pressure levels, all in dB. With this information, you can calculate the LEP,d using the formula given in the Noise at Work Regulations. With these two measurements for each different activity to be assessed, you can calculate the LEP,d and where required the LEP,w values. If you will need to provide PPE or hearing protection, you may also need to record additional values such as the C-weighted Leq (LCeq) or the Leq of the noise in Octave Bands. This information can be used to assess the effectiveness of hearing protection. The Optimus Red sound level meters can provide these functions in addition to the LAeq and C-weighted peak values. What do you need to measure these values? How you make these measurements will depend upon different factors but in most noise measurements are made with either a Sound Level Meter such as the Optimus Red or a personal noise dosimeter such as the doseBadge. You should be able to calibrate your sound level meter using an Acoustic Calibrator which meets the requirements of at least Class 2. To ensure that your equipment is calibrated correctly, you should not use a sound level meter and acoustic calibrator from different manufacturers unless you have very specific information and instructions as to how these two units will work together. It is possible to create large errors in the calibration level which should be avoided wherever possible. 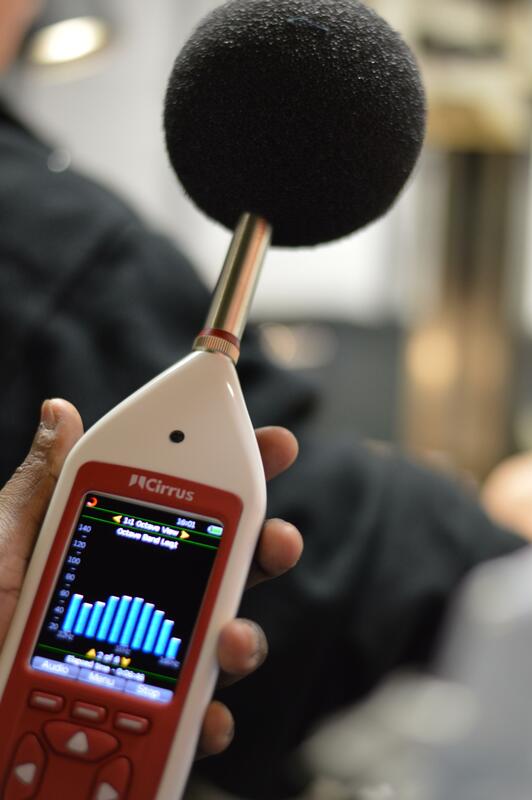 The Optimus Red Sound Level Meter will provide all of these functions and are the ultimate tool for noise at work measurements. A noise dosimeter may be very useful for measuring noise exposures of workers who are mobile, driving vehicles, working in environments where access is difficult or where their working pattern varies significantly and may be difficult to predict. The doseBadge is the ideal noise dosimeter for this type of noise measurements. An acoustic calibrator should be used to check the meter each day before and after making any measurements. An acoustic calibrator will generate a tone at a specified level and frequency for a specified microphone. This is the reason that you should not use an acoustic calibrator and sound level meter from different manufacturers without some very detailed and specific information. Some sound level meters may have an internal electrical calibration. Be aware that this type of calibration does not check the microphone capsule which is the most commonly damaged part of a noise meter. We would recommend a CR:514 Class 2 Acoustic Calibrator for use with our Class 2 Optimus sound level meters and the CR:515 Class 1 Acoustic Calibrator for use with our Class 1 Optimus sound level meters. Contact us today to speak to a Noise Protection Manager or get a Product Quote!